0099D5C3: //89 3C 81 40 89 44 24 ? 8B 44 24 ? 00999FEE:    // 75 ?? 8B CE E8 ?? ?? ?? ?? 8B CE E8 ?? ?? ?? ?? 8B CE E8 ?? ?? ?? ?? 8B CE E8 ?? ?? ?? ?? 8B ?? ?? ?? ?? ?? ?? jmp 0099A44B // 8B 86 ?? ?? ?? ?? 85 C0 0F 84 ?? ?? ?? ?? 2B 45 ?? 0F 89 ?? ?? ?? ?? ?? ?? ?? ?? ?? ?? ?? 8D ?? ?? ?? ?? ?? ?? mesos hook what is it? Lets you read out mesos to use in other scripts or bots. Which script are you referring to? Add an Address called "TotalIncMeso" and "LastIncMeso". 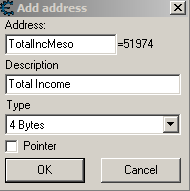 The Value of TotalIncMeso will show you how much mesos you´ve looted/earned since the script is activaed and LastIncMeso will show you how much mesos your last loot/income was. mov esi,[019A1100] //8B 0D ?? ?? ?? ?? 8D 45 ?? 50 89 7D ?? 89 7D ?? E8 ?? ?? ?? ?? 8B 40 ?? Can someone update Fusion attack/500k dmg and ch3star planet exploit Scripts Please?